Gardiner Associates Training and Research (GATR) is an Institution of Fire Engineers (IFE) ‘recognised’ training course provider and our core theory and practical courses are approved under the Continuing Professional Development scheme by the Forensic Science Society, providing an assurance of quality and content relevance. 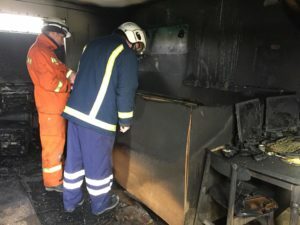 The GATR team has long fostered the inter-agency team approach to fire investigation and organises its training courses and other events accordingly. All of the training programmes are designed, developed, presented and overseen by members of a very experienced team of practitioners and experts. All of our training events are inter-active and draw not only from personal experiences and modern publications, but also at times from those who wrote or contributed to the books or as in the case of Kirk’s Fire Investigation 7th edition, also had the book dedicated to them. Whilst we acknowledge the existence and the technical level at which various electronic training packages are aimed, for the specialist field of work of the experienced practitioners we prefer to draw from the same recommended reading list and present all of the subject areas in person. Each syndicates is provided with comprehensive fire/arson investigation tool kits and has access to a purpose built fire investigation unit. Our courses are challenging, enjoyable and rewarding. Members of the GATR team have contributed and/or been acknowledged in many fire/arson related publications e.g. Home Office Fire/Police joint thematic review; Home Office Arson Scoping Study 1999; HO + ODPM circulars; Arson Control Forum (ACF) and Arson Prevention Bureau (APB) reports and written articles for fire industry journals etc.